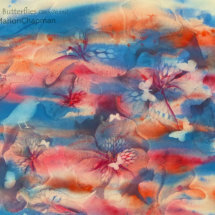 Marion will supply fuchsias and inspirational material for this one day workshop in watercolour painting. Bring along your watercolour brushes, watercolour paints and watercolour paper. The best results will be obtained from quality materials. If you need any materials supplied, please let Marion know. A suggestion of paper size is 2 x A3 sheets (or 2 x half sheets) and boards to match the size of your paper. Tubes to bring include permanent rose and your favourite green.